Take the right way on the highway with nüvi 765T, featuring lane assist. This feature guides you to the proper lane for navigation. The 765T adds hands-free calling to the nüvi 755T. 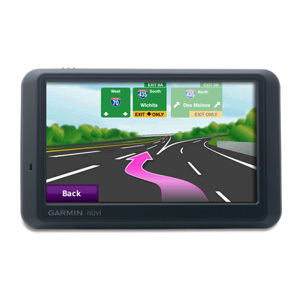 Like the rest of the nüvi 705 series, this advanced navigator comes with premium features including 3-D building view, faster screen redraws, route planning, emergency and car locators and much more. 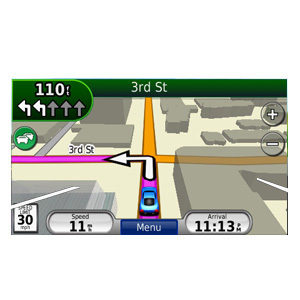 nüvi 765T takes navigation to the next level with lane assist. No more guessing which lane you need to be in to make an upcoming turn. Lane assist guides you to the correct lane for an approaching turn or exit, making unfamiliar intersections and exits easy to navigate. It realistically displays road signs and junctions on your route along with arrows that indicate the proper lane for navigation. Lane assist is available in select metropolitan cities. nüvi 765T's intuitive interface greets you with two simple questions: "Where to?" and "View Map." Touch the color screen to easily look up addresses and services and get voice-prompted, turn-by-turn directions that speak street names to your destination. 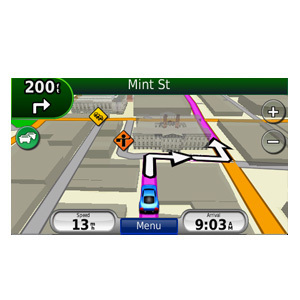 It comes preloaded with detailed City Navigator® NT street maps, nearly 6 million points of interest (POIs) and features digital elevation maps and 3-D building view in some areas to help you orient yourself with your surroundings. You can also upload custom POIs. With HotFix® satellite prediction, nüvi calculates your position faster to get you there quicker, and its ultra-fast map redraw ensures a smooth user interface. For hands-free calling, nüvi 765T integrates A2DP Bluetooth® wireless technology with a built-in microphone and speaker (optional external microphone available). Just pair it with your compatible Bluetooth phone and talk hands-free through the 765T while staying focused on the road. Simply dial numbers with nüvi's touchscreen keypad to make a call. To answer calls, just tap the screen and speak into its built-in microphone. Enjoy convenient one-touch dialing for contacts and points of interest. Even listen to high-quality stereo music on your headset with A2DP Bluetooth technology. Steer clear of traffic with nüvi 765T's integrated FM traffic receiver. Receive alerts about traffic delays and road construction that lie ahead on your route. Next, simply touch nüvi's screen to view traffic details or detour around the problem area. Keep track of yourself and your car with nüvi 765T. Just tap the "Where Am I?" emergency locator to find the closest hospitals, police stations, fuel stations, nearest address and intersection. Also see your exact latitude and longitude coordinates. nüvi 765T even remembers where you parked. It automatically marks your position when you remove it from the windshield mount, so you can navigate with nüvi on foot and find your way back to your vehicle. Perfect for unfamiliar spots and crowded lots such as amusement parks, stadiums and malls. 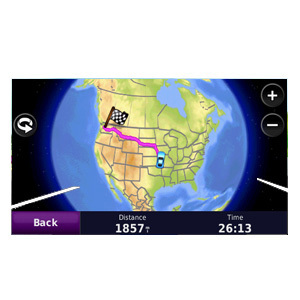 nüvi 765T includes advanced navigation features to take the worry out of traveling. With route planning you can save 10 routes, specify via points and preview simulated turns on the 765T's wide screen. In addition, nüvi 765T automatically sorts multiple destinations to provide an efficient route for errands, deliveries or sales calls. It also displays speed limits for highways and Interstates in the U.S. and Europe. A trip log provides an electronic bread crumb trail of up to 10,000 points, so you can see where you've been on the map. With nüvi 765T's widescreen display, you'll always get the big picture. View map detail, driving directions, photos and more in bright, brilliant color. Its sunlight-readable, 4.3-inch display is easy to read — from any direction. Like the rest of the nüvi 705 series, nüvi 765T sports a sleek, slim design and fits comfortably in your pocket or purse. Its rechargeable lithium-ion battery makes it convenient for navigation by car or foot. Navigation is just the beginning. nüvi 765T includes many “must have” entertainment and travel tools including MP3 player, audio book player (subscription to Audible.com required), world travel clock, automatic time zone transition, currency converter, unit converter, calculator and more. With nüvi 765T's wireless FM transmitter¹ you can hear audio, including voice prompts, MP3s and audio books, through your vehicle's stereo. Show off photos of your travels with nüvi's picture viewer. 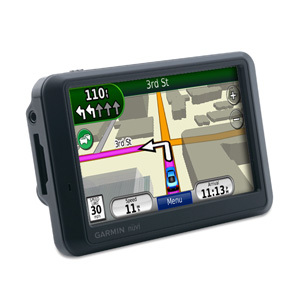 The 765T comes with Garmin Lock™, an anti-theft feature, and optional plug-in SD cards enhance your travel experience.